Maggi noodles is a brand of instant noodles manufactured by Nestlé. In several countries, it is also known as "maggi mee" (mee is Indonesian/Malay/Hokkien for noodles). 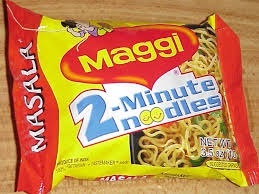 Maggi noodles are part of the Maggi family, a Nestlé brand of instant soups, stocks, and noodles.